CHITWAN, Nepal, Aug 6 2012 (IPS) - Farmers in this fertile central district of south Nepal are convinced that an intense drought between May and early July that destroyed their maize crops is the result of climate change. “Last year my farms produced over 20 quintals of maize, but this time I could barely harvest one quintal,” 60-year-old farmer Padmakanta Poudel told IPS in the remote Jutpani village of the district. Poudel explained that his family had taken bank a loan of over 500 dollars to invest on his maize farm. The money was spent on hiring a tractor to till the farm, the labour to sow the seeds as well as inputs such as fertilizers. For a poor farmer in Nepal a 500-dollar loan is substantial and repayable only at harvest time. “We lost all our money and will have to pay back our debts. I pray that my rice crops will not also be destroyed,” Poudel said. Padma Puri’s situation is worse. “I am only a tenant farmer, but I have to repay everything after this disaster,” says this 58-year-old female farmer who could barely produce 20 kg of maize this year and is faced with mounting debts. Farmers speaking with IPS in Chitwan said that they now realise that this is the climate change they have been hearing about over radio and television. “I had heard about climate change (Jal Wayu Paribartan in the Nepali language) but I didn’t know we would be affected by it so badly,” says Ram Chandra Chepang from the village of Shaktikhor. Chepang’s farms produced barely 50 kg of maize compared to three quintals last year, enabling him to buy enough food to last six months. Now he is desperately looking for a job as daily wage labourer to repay money borrowed for farm inputs from a local moneylender. Nepal has a history of droughts but the intensity increased this year, say government experts. They, however, are yet to make scientific measurements of the intensity. Evidence of climate change in Nepal is seen in temperatures rising by about one-tenth of a degree annually, receding glaciers and snow line and volatile monsoonal rains. While scientists are still trying to link these changes to factors such as production of greenhouse gases and deforestation, Nepal’s farmers are coping on their own with dwindling water supply, flash floods and landslides. Chitwan, a major producer of maize, has suffered a 70 percent loss of the crop due to late arrival of the monsoons this year, according to assessments by the government’s Agricultural Services Office (ASO) at Ratna, 300 km west of national capital Kathmandu. “Maize farmers have been devastated and they feel this is a direct impact of climate change, ASO’s Ganesh Shrestha told IPS. The ‘Crop Situation Report’ for July 2012, produced jointly by the ministry of agriculture, Food and Agriculture Organisation of the United Nations and World Food Programme had warned that the delay in monsoon, combined with insufficient pre-monsoon rainfall, would adversely affect maize and summer vegetables. According to the joint report, the hill and mountain belts, where rain-fed agriculture is predominant, would be hit worst. While the monsoon revived somewhat late July, it is too late to save the maize crops. “The situation was worrisome when we visited the rain-fed areas in the Terai (fertile southern plains) and we saw that the maize had been completely destroyed. This was a surprisingly intensive drought,” said Navaraj Pradhan, ecosystem adaptation analyst from the International Centre for Integrated Mountain Development (ICIMOD) in Kathmandu. ICIMOD is currently conducting a study on climate change impacts on food security in the entire Indo Gangetic plains. This region includes thickly populated areas like India’s Uttar Pradesh and Bihar, Nepal’s Terai and Bangladesh’s basin area. There can be two droughts in a year without causing too much damage, but when there is drought intensity that can destroy maize, even in irrigated areas, according to ICIMOD experts. With such unpredictability of weather patterns growing in the country, there is need now for planned adaptation. “Until now most farmers have been using autonomous adaptation and that is not sustainable when drought intensity is growing,” Jit Narayan Sah, technical officer and researcher from the Nepal Agricultural Research Centre (NARC), told IPS. Sah explained that autonomous adaptation in Nepal are short term solutions like channeling waters from nearby rivers, using composting, using green manure and indigenous methods to control pests. 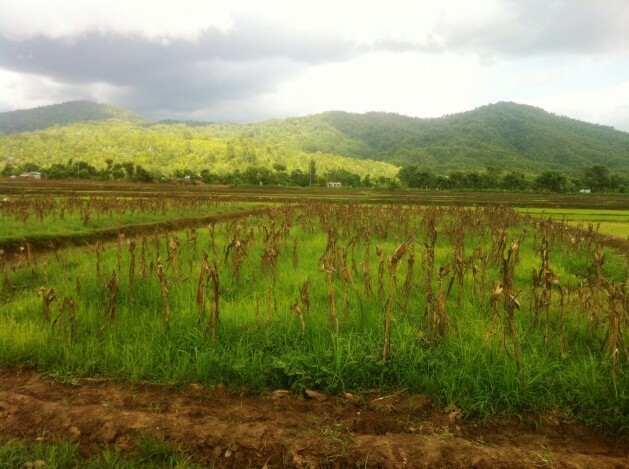 Experts believe that planned adaptation must include comprehensive research that leads to action with agricultural policy reforms and integrate that in the farming system by working closely with the farmers. While there is growing awareness among farmers on the effects of climate change, their coping strategy is weak. “There are no experts telling the farmers what to do during such situations and there are also no policies or programmes guiding them,” said a Nepali agricultural expert from an international NGO who cannot be named because he works closely with the government. The expert said there was a need to build awareness among farmers on “extreme-events”. Telling them the causes is not enough but they need to be given options and guidance along with an increase infrastructure such as irrigation. For now, farmers are trying to make do with grossly inadequate tube wells. “They are doing everything on their own. With natural water resources drying up, the farmers are even working with each other to build larger water storage,” says Sah. Climate change adaptation may take a long time to implement in Nepal given that the country is still struggling to complete a peace process since 2006 when a decade of armed civil strife ended in the country. “Climate change adaptation is not a top priority right now,” says Sah.